I was just DELIGHTED by the positive response to my first Friday Fun Facts post last week! I'm going to make this a regular weekly feature on my blog. 1) Jamie's baby brother, who died at birth along with his mother when Jamie was eight years old, was named Robert. (AN ECHO IN THE BONE, Chapter 21, "The Minister's Cat".) We've known about this baby brother for a long time, but we didn't know his name until ECHO came out. Salt causes leeches to dry up due to the hypotonic state inside the leech's body. It's way saltier outside than inside the leech. The water will travel through osmosis to the surface of the leech's skin in an attempt to dilute the saltiness, but this will cause the leech to dry up internally and fall off. 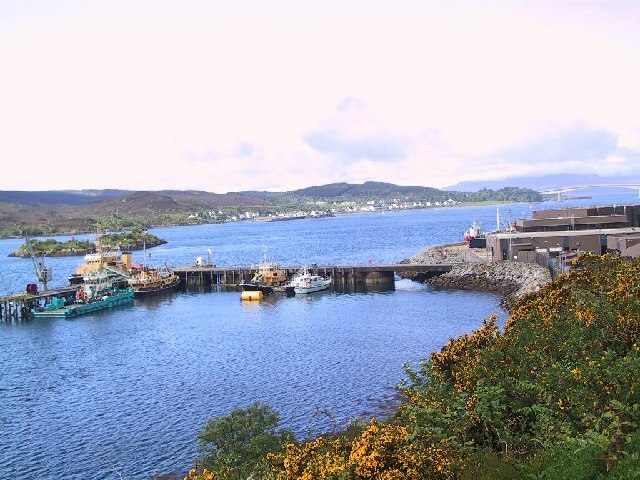 3) Roger was born in Kyle of Lochalsh, Scotland. (FIERY CROSS, chapter 6, "For Auld Lang Syne") Judging from pictures like the one below, it looks like a beautiful place. 4) Dauco seeds -- the seeds of the wild carrot, Daucus carota, also known as Queen Anne's lace (shown below) -- are still occasionally used today as a natural method of contraception. Here's an article with more details. 5) Jane McCrea, the scalped woman mentioned in ECHO, was a real historical figure. He’d never heard a sound like that before--a shriek of such horror, such grief, that his heart froze in his chest. "Jane! Jane!" A Welsh lieutenant he knew slightly, called David Jones, was forcing his way through the crowd, beating at the men with fists and elbows, lunging toward the surprised Indians, his face contorted with emotion. "Oh, God," breathed a soldier near him. "His fiancée’s called Jane. He can’t mean--"
Jones threw himself at the pole, snatching at the fall of honey-colored hair, shrieking "JANE!" at the top of his lungs. The painting below by John Vanderlyn (1804) depicts the incident in which she was killed. I hope you enjoyed these! Stop by next week for more Friday Fun Facts! Great post! I was curious about that plant since it seemed that it took Bree a long time to get pregnant again. I was worried that the plant had turned her sterile. Yay Karen! I'm thrilled that you'll be doing this each week. When I first read about the leeches I had to do a double take because I thought it read "hypnotic state" haha! The pictures make it even more interesting. Wow--just wow. Thank you! Fascinating facts; keep them coming. Thank you so much Mrs.HENRY ! "Friday Fun Facts" are great ! Looking forward to the next one. Hello from freezing Paris,FR. @Michelle - Oh, that's an interesting (and sobering) thought, that the use of the seeds might have made her sterile. Glad it wasn't the case! @Faith - I'm glad you liked it! @Mary - thanks, glad you liked these! @Julia - I'm delighted to hear that! Everybody has been really supportive of this idea, and I will certainly keep doing it. @Christiane - Thanks! And please call me "Karen", everyone else does.